Sara Conrad worked in the marketing department at the hospital where she gave birth in Northern California. The last thing she expected was to have a life-changing trauma there. 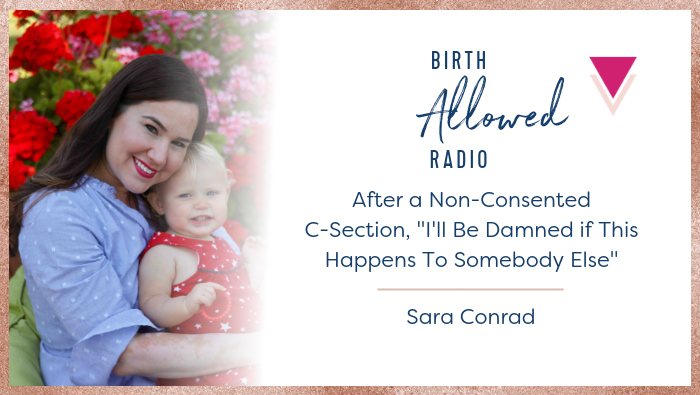 Sara immediately felt unsupported when a doctor she’d never met responded to her birth plan by telling her she loved performing Cesareans, and the nurse seemed terrified that Sara was laboring on her hands and knees. Unable to speak while on heavy medication and ignored by her care team, Sara was rolled back for a Cesarean without her consent and without knowing why she was having surgery. Afterwards, she felt disconnected from her baby and, on top of that, guilty about not feeling more joy about her birth. Her trauma carried through to postpartum, and she eventually left her job–angry and feeling betrayed about how she’d been treated and the lack of empathy and accountability from her co-workers. Today, Sara is still seeking answers and healing–following up to take the hospital to task and to advocate for other birthing women by working on the documentary film about obstetric violence and birth trauma, Mother May I.